While I wait for an opportune time to spray, I've been working on my Kastelans! I'm thinking I'll probably want to add something more to the bases generally, as well as a general wash/highlight to bring the detail out further too. I probably need to do the same for the Vanguard too, so will look to do that as a batch next. Edited by Chaeron, 02 April 2018 - 04:58 PM. Good gravy, those Kastelans look MEAN. The weathering really sells that "just took them out of the 10000 year old box" concept, too! Thank you WarriorFish! I'm thinking about how I can further improve them (and some of the other models), so watch this space to see what else occurs! Thanks Vel'Cona! Glad to see they have the desired visual effect - always hard to tell when you're weathering things. Unsure if I'll start on the Thanatar soon, as I'm awaiting his partner in crime to arrive, with the Archomagos (Scoria to be! ), to nearly complete my dream list (at the very least, I can do the majority in proxy anyway!). I just wanna see the Thanatar painted, so I'd say why wait??? Your wish is (slowly) my command! So, aside from a single Castellax and three Vorax, and by utilising my beloved Skitarii as Tech Thralls, the dream list is nearly complete. All positive - but now, I'm naturally thinking of what else would be cool to add for future... That said, I'm going to focus on this to get this all finished and onto the table - which I'm just as excited about! Edited by Chaeron, 02 April 2018 - 04:59 PM. So, I've systematically highlighted the orange (you may not be able to see due to the light! ), and have then washed all everything in Seraphim Sepia for that nice tone. All the Thallax with chainblades have had hazard stripes added, and I've blocked the first bit of blue on their Lightning Guns. I've initially done cabling in Genestealer Purple, which I think works nicely with them. I've also painted the 'faces' in my usual scheme, but require a highlight to indicate light. I'll probably do this last though! I've also done the base layer on all the bases that need it - ready for Martian Ironearth etc. Next will be detailing of other cables, highlight on the Lightning Guns, and see what else... I'm thinking through whether I want OSL jet-packs. But, happy with how they're all progressing anyway! Thanks WarriorFish! Getting there, definitely. Happy to report on some more progress - I've blitzed a Lightning (for my Death Guard, admittedly!) as I've had a Heresy campaign weekend with club mates this past weekend, but I've been chipping away at the Thallax since the last update, and have today built my second Thanatar! It was slightly heavier than anticipated, so after I'd applied Martian Ironearth to the Thallax/Ursarax bases, I actually went and re-highlighted a few parts of the models - such as the chevrons, the OSL on the weaponry weaponry, and then used Troll Slayer Orange mixed with Lahmian Medium to bring back orange to a brighter shade - without undoing the weathering or the original highlights! I'm replenishing my stocks of Leadbelcher spray, so the second Thanatar will have to wait slightly, but hopefully I can get it up to where the first is, and then get them both finished together quite quickly. It means that the Castellax and Homonculex (Domitar) will get my attention next! Edited by Chaeron, 02 April 2018 - 05:00 PM. But seriously, awesome progress! The spare/rusted bits and gears on the base really do add a lot to the look of your 'bots, especially on the big guys. Keep it coming! These guys are looking great. I'm glad you took the extra time to detail your bases. They look so much better just for having some ruined machine parts laying around. I like the checkerboard base too but it does stand out a lot. Is that particular model noteworthy? 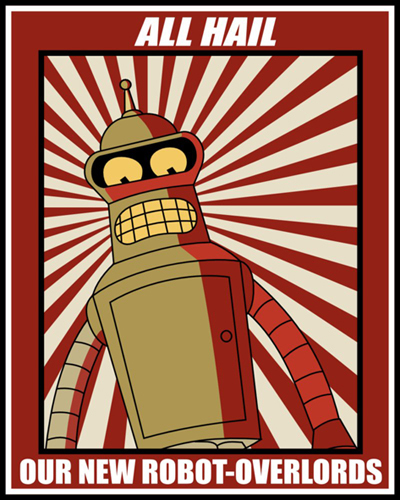 You've done a great job on both the Adeptus Mechanicus and Mechanicum models. I still prefer the Forge World models but you've made the Kastellan look good too. Thank you Flame Boy! I'm actually thinking I might change the checkerboard base - as three of my Thallax were purchased with lovely resin bases, but I think they don't totally fit with the others now. I'll probably remove them and use them elsewhere, just so I have fully uniform basing across them all! I've just finished the basing on all my 60 Skitarii and four Kastelans now too. My only thought for the Skitarii now is whether I weather their cloaks (most likely with a black wash and some sponged mud) in order to match the others more fully, or if I leave them as is. I still need to do some of the dials etc. on their backs and paint their chest cogs, but they are coming close to being finished. With the second Thanatar ready to be sprayed, I'm hoping to crack on with doing both of those next - and Scoria too. Ever closer to having a fully painted list! Edited by Chaeron, 02 April 2018 - 05:01 PM. Can't wait to see them all together! Between the basing and weathering I'm really impressed you can keep your results this consistent and crank them out as fast as you do. I find when I start to work fast, my work suffers for it. Wonder if you have any tips? So with the majority of the armour and metals basically done, and the first stage of highlighting and weathering, I'm going to work through the more specific parts - cables, details, the mortar etc. in turn. There are a few bits of metal to tidy up as we go too (you can particularly see around the 'head' and cowl region), but on the whole - happy with how consistent they are - and looking forward to getting those on the table. Scoria is also waiting to be painted - and I am just trying to prepare for how I'll paint him! It'll still be with the Ryza theme, but I think it's just working out how to paint the Abeyant appropriately. I'd like to make a start on him soon, just because bar the Thanatars, I'm very close to having everything I need painted... That said, I've picked up a copy of the Eradication Force box-set to add to my 40k belongings, and with two Dunecrawlers, an Ironstrider, ten Ruststalkers/Iniltrators and three Destroyers still to be built - it should keep me busy for quite a while! 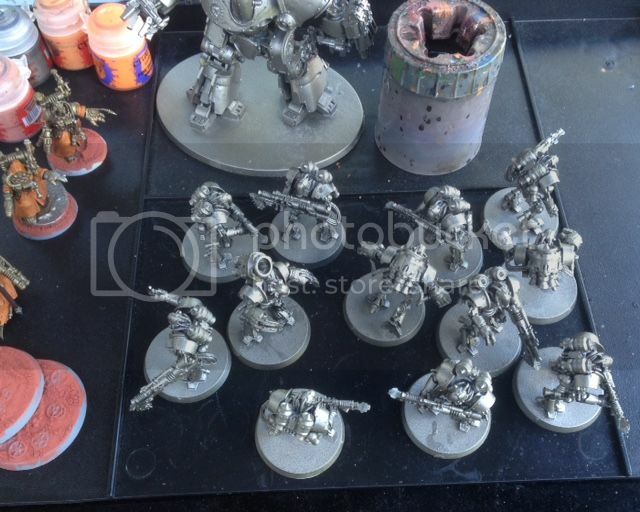 In terms of tips for batch painting, I tend to like to set manageable goals (even breaking it down appropriately - those sixty Skitarii needed to be!) - and if it gets to a point where I need a break, I'll look to stop before compromising the quality. I work quite visually, so it's nice to either put them in a line or on one side, and moving them over systematically to see how well you're doing - which I tend to find motivates me to continue on. If I'm doing things in a batch, focusing on one aspect (colour or part) means I can break it up further, and move through things quickly without needing to swap colours/brushes. 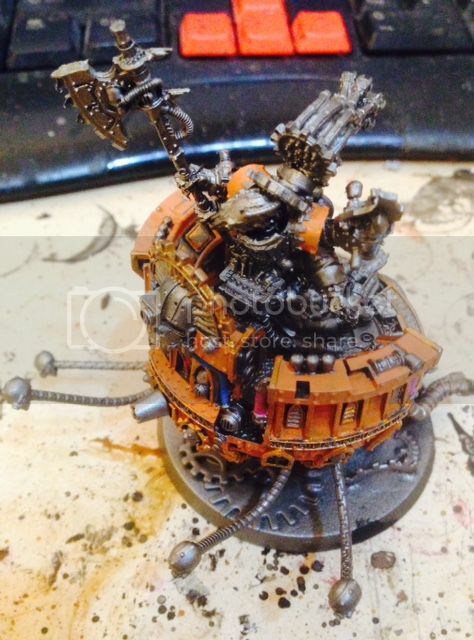 A recent example would be the Mechanicum crests on the Thallax: working systematically gives me a great sense of achievement when I can fully compartmentalise what I'm doing and what needs to be completed! It's not an approach that works for everything, but I find it particularly useful with models with lots of small parts, with plenty of detail and a potential panoply of colours. Hope that's useful! Quality work here! Where'd you get all the cogs for the bases? I especially love the weathering, looks amazing! Thanks Tyriks! They're literally just small cogs and gears from online mostly used for scrapbooking and things like that. I've broken some of them up (as you can probably see) to vary it, as well as piling them at different heights, and with the textured basing material to make them look buried within the sands of Mars/Ryza. So much lovely detail to pick out! As ever, I'm trying to incorporate the specific colours I typically use for cables, and trying to work that through. 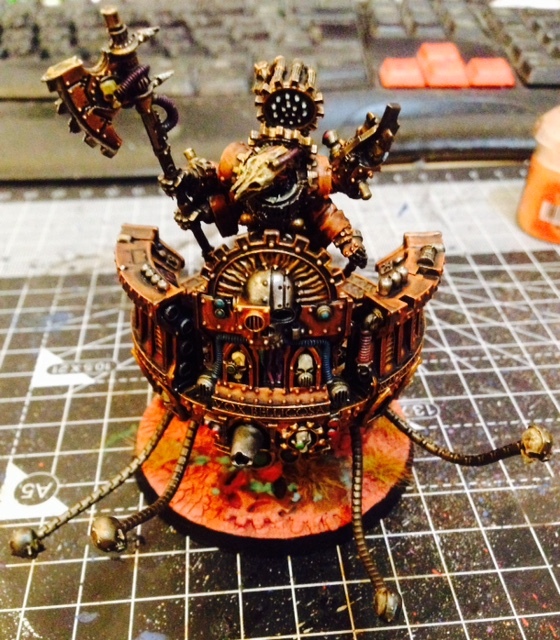 I've mostly done blocking on the Abeyant so far, and I'm mostly happy with the effect! I've gone for more gold (than my usual Sycorax Bronze) to look both fancy and naturally, because it's such a good conductor, only seem appropriate! Plenty still to go - and I'll balance this with finishing the three Thanatars over the next few weeks. I am impressed at how quickly you work good sir. 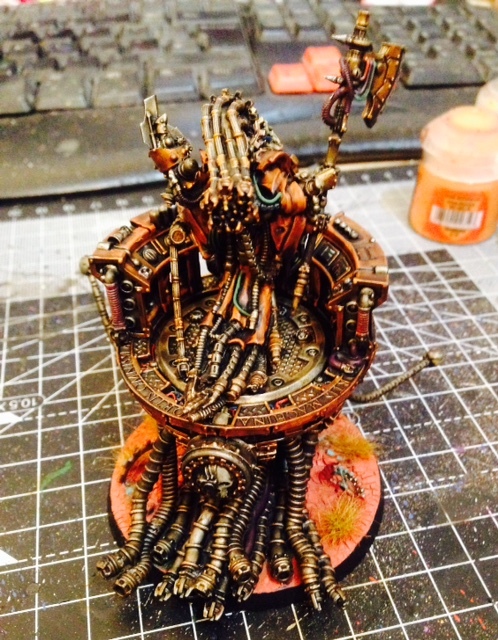 I like the cogs on the base. Did you say you are going to put the textures basing material over them to look part buried? That's going to look amazing. I think I have some smaller cogs myself. A friend of mine bought some watch components. I wonder how many watches were sacrificed to the Omnissiah that day? Anyway, keep up the good work. You are putting my glacial progress to shame. Thanks Flame Boy! That's right with the cogs, although I've been trying to avoid burying them too much - but I hope the ones sticking up will help with that effect! I've done it initially with the Thallax and Castellax, and with the oxidisation now on the metals, it will hopefully help this to show up nicely. I think it'll also be more obvious on the larger bases too! I want to go back and add the smaller cogs to the Skitarii based in time, and I will probably do that as I batch paint some of the details as part of a usual production line. I think I may need some more cogs and gears at this rate! I'd like to know where you're getting them from in the first place! This'll mean I can go back to my Thanatars, to finish that batch and basically round off my initially planned 3,000pts force! Although, I've just received some reinforcements - in the form of a pair of Vulturax and Venators - which'll push me nicely towards the 4,000pts, so I'm hoping to prep those and get those painted in due course too. Edited by Chaeron, 02 April 2018 - 05:02 PM. Wow, your Archmagos is amazing. The contrasting colours work well. The blue ducts at the front of the Abeyant frame the skull details nicely. I also like the gold/silver skull detail as well. The Magos looks imposing as well. The orange is a really powerful shade on the robes. Thanks so much Flame Boy - much appreciated! There are probably a few bits of the orange I'll brighten up on the larger panelled areas, but he has taken shape quite nicely and I'm pleased with the result! As you may be able to see - it's basically just the Thanatars, as will need to do their detailing now they are all at the same stage of painting. This evening, I've got the Vulturax and Venators prepared and they are currently soaking - so will look forward to assembling and getting those done in due course! So awesome . . . I'm glad to hear there's more coming!